and Jon Kyl in Tuba City during water rights session. US Interior Secretary Ken Salazar wants to push the Navajo-Hopi Little Colorado River Water Rights Settlement, already rejected by Navajos, through an upcoming Lame Duck Congress, according to a document leaked to Censored News. The memo from the Navajo Nation Washington Office states there will be a meeting on Nov. 14 in Washington, between Salazar and Navajo and Hopi officials to discuss the water rights settlement, along with the Navajo Generating Station, one of the dirtiest coal fired power plants in the US which Navajo and US politicians want to remain in operation. Already numerous Arizona Indian Nations have accepted “water rights settlements,” which opponents say are the theft of Indian water for the US, pushed through by non-Indian attorneys. Those opposing the Little Colorado River settlement say it requires the Navajo Nation to give up expansive water rights under the Winter’s Doctrine and future generations of Navajos would suffer. The current scheme involves Salazar meeting with Navajo and Hopi officials, then persuading Arizona Sen. Jon Kyl to modify the legislation that has already been rejected and push it through an upcoming Lame Duck session of Congress following the elections. The Navajo Washington Office letter states, "The Secretary believes that if the Tribes can come to agreement on the portions of the settlement that raised the most objections, he can convince Senator Kyl to make changes to the settlement. If the settlement can be changed there may be a window of opportunity for passage during the upcoming 'Lame Duck' Congress after the November election." The letter from the Navajo Washington Office is addressed to Navajo President Ben Shelly and Navajo Council Speaker Johnny Naize. In the typical heavy handed style of US bargaining and political blackmail, Salazar says in his letter to the Navajo Speaker that they will also discuss housing in the Bennett Freeze area, where Navajos live in desperate conditions. A primary reason that the US wants the water from the Little Colorado River is to keep the Navajo Generating Station operating, a leading source of global warming. The coal fired power plant on Navajoland near Page, Ariz., was founded on the abuse of Navajos. An attorney for Peabody Coal orchestrated the so-called Navajo Hopi land dispute in order to remove more than 14,000 Navajos from Black Mesa through relocation, so that Peabody could get to the coal. Today, Peabody coal from Black Mesa fuels the Navajo Generating Station which provides power to Southwest cities, while many Navajos live without electricity. 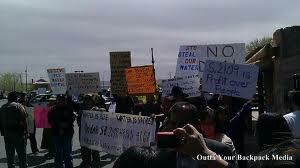 Phoenix and Tucson are now dependant on this electricity and desperate for Indian water. Coal mining depletes the aquifer on Navajoland, while most Navajos on Black Mesa live without running water.